« Win $2,500 in free consulting from Socialbrite! We’ll be reporting on many of these events and invite you to share your coverage or observations on Socialbrite, or let us know and we’ll tweet it or Facebook it. Throughout the year we’ll publish monthly calendars on the first of the month. If you know of other must-attend events, please add them by posting in the comments below. Note that on Monday we’ll be publishing a calendar of 2013 conferences in social media, tech, mobile and marketing on our sister site, Socialmedia.biz. Update: Here’s Socialmedia.biz’s 2013 conferences: Social media, tech, mobile & marketing. New Media Expo, often called Blogworld, is the first and only tradeshow, conference and media event dedicated to promoting the dynamic industry of blogging and new media. If you are currently blogging, vlogging, podcasting, producing some other form of new media content, thinking about joining the exciting industry of new media or just want to know what this whole blogging phenomena is all about then you need to be at New Media Expo. TransportationCamp is an unconference series about transportation and technology. Meet the thinkers and doers, and get ready to talk and learn about improving mobility, information design methods, bike share systems and more. WordCamps are informal, community-organized events that are put together by WordPress users like you (note: They’re generally not free). Everyone from casual users to core developers participate, share ideas and get to know each other. The year’s first WordCamp takes place in Victoria, British Columbia, on Jan. 12. See the main Word Camp site for a full schedule of events. This national meeting is a call to action for activists, urban farmers, food system workers, immigrant rights advocates and anyone seeking to explore community-driven solutions to promote food equity through the lens of race, class and gender. Intersection Event Jan. 19 Mtn. View, Calif.
What would happen if you put some of the most innovative, ground-breaking thought leaders from the business world in a room with some of the most creative and influential social change agents of our time for one day? The Intersection Event will forge an “intersection” of ideas and commentary between leading innovators from academia, entrepreneurship, technology and entertainment. A PodCamp is a free BarCamp-style community unconference for new media enthusiasts and professionals including bloggers, podcasters, YouTube producers, social networkers and anyone curious about new media. See the main PodCamp site for a full schedule of events, including Toronto and Cincinnati. For more than 40 years, Davos has provided an unrivalled platform for leaders from all walks of life to shape the global, regional, industry and business agendas at the beginning of the year. The 2013 program includes The Global Agenda: How to get the global economy back on to a path of stable growth and higher employment, How to address persistent vulnerabilities within the international financial system, How to increase global, national and industry resilience to major systemic and catastrophic risks, and more. She’s Geeky Jan. 25-27 Mountain View, Calif.
She’s Geeky convenes to inspire women for the future, creating a space to connect women from diverse STEM (sci-tech) communities. They promote activities and organizations in regions around the country, inviting participants to meet in an unconference setting where the agenda is created live at the event. The Emerging Media Conference welcomes attendees with an opportunity to view and experience the latest in technology advances and upcoming product roll-outs. Included in this unique program are demonstrations, presentations and discussions led by some of the most connected and recognized experts in the industry. This is the first and only event to solve industry challenges in real time. Front End of Innovation EMEA provides new ways to deliver value through innovation by connecting through content. This is the one event for best-in-class presentations from multi-national leaders. The Mission-Driven Management Summit is the only event of its kind in North America that features case studies from Hall of Fame social and public sector organizations that successfully use the Balanced Scorecard method to achieve results. This event is designed for managers and executives of all levels interested in building and sustaining a high-performance organization. Join 5,000 peers at the world’s premier series dedicated to social media for social good. All sessions are designed to provide attendees with concrete insights and takeaways, showcasing best practices, pitfalls to avoid and free, helpful resources for nonprofits and causes. South by Southwest offer the unique convergence of original music, independent films and emerging technologies. Fostering creative and professional growth alike, SXSW is the premier destination for discovery. Join cool geeks and techies, indie filmmakers or up-and-coming musical acts. Social Capital Markets plants a flag at MIT for a one-day gathering of social entrepreneurs and change agents. The Annual Conference on Corporate Contributions is the premier conference in the U.S. for professionals in corporate citizenship, corporate social responsibility, community relations and volunteerism, assembling well-known speakers, authors, practitioners and educators. The eCampaigning Forum is a groundbreaking event and community for campaigning and digital campaigning leaders and to connect, share experience and learn together. Grants Managers Network March 18-20 St. Petersburg, Fla.
At the Grants Managers Network Annual Conference gain valuable new ideas, tools and resources at interactive, hands-on learning sessions designed to support those new to the field as well as seasoned professionals. This conference will equip you to solve the most pressing challenges facing our industry today. Don’t miss this opportunity to explore bold ideas that can position you and your organization for success. Left Forum convenes the largest annual conference of a broad spectrum of left and progressive intellectuals, activists, academics, organizations and the public. Participants come together to engage a wide range of critical perspectives on the world, to discuss differences, commonalities, and alternatives to current challenges and to share ideas for understanding and transforming the world. The Cause Conference brings together both for-profit and nonprofit professionals at the largest cause partnership event on the West Coast. This year’s conference focuses on the intersection of purpose and profit and how creating meaningful partnerships leads to sustainable value. Social Enterprise is a dynamic way of doing business that can transform communities and drive lasting social change. This conference will give you the opportunity to network, interact and learn from high-caliber speakers in a topical and thought-provoking program as well as meet, trade and do business with 150 exhibitors. BlissDom is for women who find and express their bliss by publishing online. Speakers and panels will feature the best blogging, public relations and social media pros who’ll be on hand to mentor new and old friends. At this ninth conference, speakers and panels featuring the best blogging, public relations and social media pros will be gathering to mentor new and old friends alike. The path to successful mobile fundraising starts with successful donor cultivation of mobile engagement, resulting in successful fundraising campaigns. Innogive will be holding its fourth annual conference for innovative use of mobile tech by nonprofits. Organized by FreePress.net, the National Conference for Media Reform is dedicated to changing the media and building a better democracy. This fifth annual gathering will bring together students and national youth organizations to create and implement Commitments to Action across five focus areas: Education, Environment & Climate Change, Peace & Human Rights, Poverty Alleviation and Public Health. The CGI U meeting will include plenary sessions, working sessions and other special events that provide participants (who must apply by Jan. 30) with a wide variety of knowledge-sharing and networking opportunities. For the past half-century, the AFP International Conference on Fundraising has helped fundraising professionals around the world face a variety of challenges. This year, the goal is to engage and re-energize the fundraising industry, create balance, focus on critical priorities and simplify complexities. This conference brings together hundreds of leaders in women’s philanthropy, including grantmakers, donors, industry experts and activists. Investing in Women will explore the latest models in collaboration, in giving and in making an impact. Hear from organizations who are making lasting systems change in the U.S. and around the world, and learn how to measure the impact of your work and tell the story to increase engagement. Since 2004, the Skoll Foundation and its partners at the Skoll Centre at Oxford University have convened this invitational event, which hosts more than 800 delegates from over 65 countries for three remarkable days of sharing, learning and inspiration. Delegates represent the best and brightest thinkers and practitioners from the social, academic, finance, private and policy sectors. NTC: Nonprofit Technology Conference April 11-13 Minneapolis, Minn. This three-day gathering brings together nonprofit professionals from around the world to collaborate, innovate and maximize effectiveness. With a wide mix of social events, seminars, trainings and resources, NTEN’s Nonprofit Technology Conference will help you put technology to work to further your cause. Global Health and Innovation April 13-14 New Haven, Conn.
Last year Unite for Sight’s Global Health and Innovation Conference devoted a full session of speakers to Social Change and Impact and addressed issues regarding changing the world for the better. Here is the speakers’ lineup for this spring, including speakers at the forefront of philanthropy and social entrepreneurshp. Global Philanthropy Forum April 15-17 Redwood City, Calif.
A project of the World Affairs Council of Northern California, the Global Philanthropy Forum aims to build a community of donors and social investors committed to international causes and to inform, enable and enhance the strategic nature of their work. The gathering is intended for individuals who have made a significant commitment to international philanthropy, donors who have established family foundations and executives of corporate, private or public foundations based in the U.S. and overseas. With 60 individual events in film, art, music, eco-fashion, food, design, parties and two major impact investing conferences, Sustainatopia is one of the biggest sustainability and impact investing events in the hemisphere. The Sankalp Forum is a holistic ecosystem designed to catalyze impact investments into sustainable and scalable social enterprises globally. The annual Sankalp Unconvention Summit is one of Asia’s largest collaborative platforms to bring together social enterprises, impact investors, policy makers, academicians and other market makers. The summit will bring the entire network together to discuss emerging trends and to recognize the best social enterprise models through the Sankalp Awards. Global Engagement Summit April 17-21 Evanston, Ill. The Global CSR Summit & Awards 2013 celebrates its 5th successive year at the beautiful city of Davao on Boracay Island in the Philippines. Organized by the Pinnacle Group International, the summit on corporate social responsibility has been at the forefront of the sustainability debate, introducing cutting-edge ideas and issues to the Asian business community. Successful corporate citizenship is all about managing many interests – the community, workplace, marketplace, investors and others – in a way that contributes to the bottom line. How to make this work for your company is the focus of this year’s Corporate Citizenship Conference. Ignite Phoenix April 26 Scottsdale, Ariz.
Ignite Phoenix is an information exchange, fostering and inspiring Phoenix and global communities to share, experience and enjoy different topics from the creative and subjective, to inspirational, technical and philosophical. Presentations will educate, exhilarate, motivate and move you, and you’ll look at your world in a whole new light. Calgary Chamber of Voluntary Organization’s conference will bring together leaders from the nonprofit sector, the corporate community, government and other funders and community leaders to dialogue about the significant changes that will impact the sector and its ability to meet community needs in the future. Business4Better (B4B) May 1-2 Anaheim, Calif.
Business4Better (B4B) will bring together midsize business, large corporations and nonprofits to define mutually beneficial partnerships. The B4B conference, expo and movement encourages a level of engagement that will inspire businesses to action, connect them with like-minded nonprofit organizations and create better-than-ever partnerships that are redefining social purpose and transforming business impact on societal causes. At the Digital Leap 2013 conference, learn digital marketing strategy and techniques from the experts, find out about incredible digital marketing opportunities for your charity, give your digital presence a boost for better results and many more. The goal of the 99U Conference is to shift the focus from idea generation to idea execution. To accomplish this, we bring together some of the world’s most productive creative visionaries and leading researchers to share pragmatic insights on how ideas are brought to life. Front End of Innovation brings together the best of the best in innovation, R&D, product development, commercialization, marketing and strategy from leading Fortune 1000 companies to be enlightened and inspired. The second annual 501(c)onference is a full-day conference for professionals and leaders in the nonprofit sector. This conference is designed to bring nonprofit professionals together to connect people, resources and good ideas so we can imagine, design and build a stronger future together. With the theme of navigating not-for-profits in the new world, Connecting Up Australia will guide not-for-profits through new tools and ideas in the world of technology, social media and digital marketing to help them continue to innovate. The conference is an opportunity for not-for-profits to learn from inspiring international and local speakers, to engage and share with other delegates and walk away with new insights to prepare their organization for the new world and take their not-for-profit to the next level. Social Enterprise Alliance May 19-22 Minneapolis, Minn.
Social Enterprise Alliance aims for social enterprise to reach its full potential as a force for positive social change, in service to the common good. To achieve this purpose, they provide social enterprises with the tools and resources they need to succeed and work on building an optimal environment. In this conference series, these sessions are designed to provide attendees with concrete insights and takeaways, showcasing best practices, pitfalls to avoid and free, helpful resources for nonprofits and causes. Impact Investing in Action is a new kind of conference designed to support the flow of capital to early-stage companies creating change in the world. IIA’13 was launched to connect entrepreneurs with impact investors. Come meet outstanding, investment-ready companies using the market the solve social problems, learn about new investment vehicles to make it easier than ever to invest, and build relationships with some of the most inspiring and dynamic change makers you will ever meet. The Center for Effective Philanthropy’s national conference, with the theme Pursuing Results: Effective Foundation Practice, will provide philanthropic leaders with resources to maximize their effectiveness. Leaders of foundations working in Detroit will share their views on what has and hasn’t worked in their efforts to help one of the most challenged cities in America and will explore critical issues ranging from impact investing to nonprofit performance measurement and the unique challenges of being a foundation CEO. The Alliance for Community Media is where progressive media makers come together to learn and collaborate. This year’s theme is “Collaborate.” The conference focus will support the growth of business opportunities for community media centers. Cause Marketing Forum was founded in 2002 with the goal of increasing the number of successful company/cause alliances by providing business and nonprofit executives with the practical information and connections they need to succeed. The Global Action Forum was conceived to redirect the traditional fundraising approach to philanthropy toward fearlessly building bottom-up campaigns emotionally connecting and creating communities that over time morph into movements for generations to come. The Learning Conference will bring together more than 200 leaders in philanthropy for cutting-edge conversations that will showcase diverse perspectives, strategies and solutions to help navigate the challenges and opportunities associated with making learning a priority. The Emerging Media Conference welcomes attendees with an opportunity to view and experience the latest in technology advances and upcoming product roll-outs. Included in this program are demonstrations, presentations and discussions led by some of the most connected and recognized experts in the industry. Sustainable Brands is an international community of learning and action focused on understanding and leveraging the role of brands in shaping a flourishing future. The gathering is ground zero for sustainability, brand and innovation professionals who come together from around the world to be inspired, engaged and equipped to succeed by building the better brands of tomorrow, while building a network of like-minded colleagues who can help. The NMC Summer Conference is a one-of-a-kind event, attracting an audience of hundreds of highly skilled professionals interested in the integration of emerging technologies into teaching, learning and creative inquiry. The Association of Fundraising Professionals is the professional association for individuals responsible for generating philanthropic support for a wide variety of charitable organizations. In thie annual event, the association advances philanthropy in society by enabling people and organizations to practice effective and ethical fundraising. NCTech4Good June 6-7 Chapel Hill, N.C. This conference is designed to serve nonprofit professionals, volunteers and consultants, as well as small business owners. The conference focuses on technologies in areas such as fundraising, social media and communication and advocacy tools, offering both pre-selected presentations and workshops and spontaneous sessions. Personal Democracy Forum is the world’s leading conference exploring and analyzing technology’s impact on politics and government. Join hundreds of individuals interested in how technology is changing politics, governance and society. At the Social Change Institute, you’ll gain insight into the latest movement and organizing strategies, online tools, campaigns and leadership practices while immersed in the stunning natural setting of Canada’s leading educational retreat center: Hollyhock. This is your chance to break away from the daily pressures of work and life. To think big, focus your intensions, sharpen your skills and make life-long connections. Now in its 19th year, North by Northeast has become the Canadian festival destination for emerging artists and major-label headliners, for music filmmakers and for digital interactive innovators bridging the gap between technology and the arts. Seen as the most anticipated summer music event in Canada, NXNE Music, NXNE Film and NXNE Interactive are an essential gathering for artists, industry and fans. Social Media for Nonprofits June 13 Mountain View, Calif. The Tällberg Forum is an arena for reflection, conversations and the search for creative solutions, integrating both nature and the arts, where people feel free to step outside of their professional identity, to share doubts and new ideas and to search for ways forward outside of established frameworks. It acts to stimulate the conversation on, and design solutions to, the problems of our times in order to foster new thinking and solutions. Social Impact Exchange’s Symposium on Scaling Social Impact will bring together nonprofit leaders, funders, professional service providers and academics to explore the state of scaling in the nonprofit sector. The symposium is a wonderful opportunity for those interested in advancing the field of social impact to network with other like-minded professionals and build knowledge and increase skills for this important work. This National Conference on Volunteering and Service provides attendees an opportunity to learn, connect and be inspired through a wide range of exciting and informative plenary sessions, workshops, immersion learnings, special events, service projects, exhibits, specialized tracks and more. The Allied Media Conference cultivates strategies for a more just and creative world. We come together to share tools and tactics for transforming our communities through media-based organizing. Netroots Nation amplifies progressive voices by providing an online and in-person campus for exchanging ideas and learning how to be more effective in using technology to influence the public debate. At the annual convention, participants strengthen the community, inspire action and serve as an incubator for ideas that challenge the status quo and ultimately affect change in the public sphere. Indie Web Camp June 22-23 Portland, Ore.
Indie Web Camp is a regular gathering of web creators building and sharing open Web technologies to advance the state of the independent Web and empower users to own their own identities and content on the Web. Participants get together for a weekend to talk about what has been done in the field, what still needs to be done and then spend a day hacking and creating. Aspen Ideas Festival June 26-July 2 Aspen, Colo. The Aspen Ideas Festival will gather some of the most interesting thinkers and leaders from around the U.S. and abroad to discuss their work, the issues that inspire them and their ideas. Presented by the Aspen Institute and The Atlantic, the festival is dedicated to dialogue and exchange and in its commitment to bringing ideas to the public at large. The International Development Design Summit is an intense, hands-on design experience that brings together people from all over the world and all walks of life to create technologies and enterprises that improve the lives of people living in poverty. The annual Partnering for Global Impact (PGI) conference encourages participants to share knowledge, engage with issues, explore investment opportunities and partner with one another. The event is designed to enable participants to learn about and pursue investment opportunities with both a social and a financial return. Project SEARCH is dedicated to providing education and training to young adults with intellectual and developmental disabilities through an innovative workforce and career development model that benefits the individual,workplace and community. Community Leadership Summit July 20-21 Portland, Ore. The Community Leadership Summit is the meeting place for community managers and leaders from all around the world. The event pulls together the leading minds in community management, relations and online collaboration to discuss, debate and continue to refine the art of building an effective and capable community. OSCON July 22-26 Portland, Ore.
OSCON is the gathering place for the entire open source community. It’s where all the pieces of the open platform come together. Unlike other conferences that focus entirely on one language or part of the stack, OSCON deals with the open source ecosystem in its entirety, exactly as you approach it in your work. The Bridge conference brings together some of the biggest buyers, sellers and users of fundraising and direct marketing products and services. The three-day event features nationally and internationally renowned speakers and cutting-edge educational programming. Learn and grow. Challenge and inspire. Lead and succeed. The possibilities are endless. At ASAE, you’ll engage with thought-provoking speakers, experience innovative session formats, enjoy world-class networking events and much more. International Democratic Education Aug. 4-8 Boulder, Colo.
IDEC is a conference that brings together practitioners, organizers, academics, youths and educators for an international exchange on the transformation of communities, schools and learning to ensure that all young people can engage meaningfully in their education and gain the tools to build a just, sustainable, democratic world. SXSW V2V is the newest addition to the SXSW series of events. It’s an extension and reimagining of the SXSW experience with an emphasis on the creative spark that drives entrepreneurial innovation. This four-day event brings the startup and venture capital communities together with the creative industries that have helped to make SXSW so special. V2V serves innovators and entrepreneurs from across all the industries at the core of SXSW as they learn the skills, make the connections and find the inspiration to take their ideas and talents to the next level. The venerable Social Capital Markets gathering for social entrepreneurs and change agents will return to SF’s Fort Mason Center. Nonprofit Management Institute Sept. 10-11 Stanford, Calif. The Nonprofit Management Institute is conducted by leaders in the field of social change: academics known for their work at Stanford and at other renowned universities and well-known practitioners who will share their insights and experiences from successes in the field. Web of Change is a series of conferences that connects the foremost thinkers and doers in the growing community of social change and technology from across North America. Join business leaders and social entrepreneurs at the Social Venture Institute for an intensive, interactive inquiry into how to face the day-to-day challenges of running a socially conscious enterprise. Take advantage of this opportunity to fine tune business strategies, learn best practices for solving problems and build long lasting relationships with business peers and mentors. IdeaFestival Sept. 24-27 Louisville, Ky.
IdeaFestival is a celebration for the intellectually curious. It’s an eclectic network of global thinkers and one-of-a-kind innovators bound together by an intense curiosity about what is impacting and shaping the future of the arts, business, technology, design, science, philosophy and education. Whether you’re a seasoned fundraising veteran or new to fundraising, ArtezInterAction has something for everyone. This one-day conference is designed for fundraisers looking to accelerate their online activities. Blackbaud Conference for Nonprofits Sept. 29-Oct. 2 National Harbor, Md. Join this conference to experience everything you love about the Blackbaud Conference — three days of educational content dedicated to your specific needs and opportunities to network and interact with your peers and industry experts. Retail Sustainability Conference Sept. 30-Oct. 3 Orlando, Fla. This event brings together executives from all major retail and consumer product segments along with relevant solution providers to address the key issues of sustainability and environmental compliance for retail. CONNECT Oct. 1-3 Albuquerque, N.M.
At CONNECT, go deep into topics relevant to your philanthropy. Connect with peers and learn collaboratively in daylong seminars suited to your needs. Social Enterprise World Forum will be a gathering of over 1,000 Canadian and international participants involved in the social enterprise movement. Participants will share experiences, stories and learn from an international body of knowledge and experience. This event is a unique opportunity to catalyze the social enterprise sector by furthering the creation of a supportive environment for success. Grace Hopper Celebration of Women in Computing Oct. 2-5 Minneapolis, Minn.
At the Grace Hopper Celebration of Women in Computing, the theme will be “Thing Big, Drive Forward.” The conference provides rich professional development sessions wherever you are in your career: from students just starting out to mid-career technologist to senior technical women. At Salsa, expect new activities like networking – you’ll have more opportunities to network with Salsa staff, Salsa partners and your fellow do-gooders in the community. They’ll offer “Birds of a Pepper” roundtables and add more opportunities to share your stories with one another in sessions and dedicated networking time and on-site certification testing and tutoring. The Poverty Alleviation Un-Conference by Opportunity Collaboration is a four-day problem-solving, strategic retreat for nonprofit leaders, for-profit social entrepreneurs, grant-makers and social investors engaged in economic justice enterprises. This gathering leverages resources, shares innovations, enlists allies, builds coalitions and creates force multipliers. GigaOM’s Mobilize conference will explore the next frontier for connected devices. The world’s leading mobile thinkers and doers will be on hand to examine the wealth of opportunities spurred by the skyrocketing expansion of devices and apps. Bioneers Conference Oct. 18-20 San Rafael, Calif. Explore the forefront of positive change in deeply inspiring keynote talks, panels, workshops and intensives. Network with dynamic change-makers, experience Moving Image Festival screenings and networking receptions and discover powerful opportunities and strategies for creating positive change in your work, life and community. No details have been announced for the 2013 conference. TechNow is the Pittsburgh region’s premier one-day conference devoted to new and important trends and opportunities in technology for nonprofits. An eclectic mix of thought leaders and visionaries will convene in Maine for its 17th annual gathering. A celebration for the intellectually engaged, PopTech is a chance to meet the people who are inventing our future and an opportunity to partake in stimulating presentations, exhilarating performances and life-changing conversations. BSR works with its global network of more than 250 member companies to develop sustainable business strategies and solutions through consulting, research and cross-sector collaboration. BoardSource Leadership Forum is the only national conference focused on the impact of nonprofit boards and the role they play in advancing the public good. Develop your governance skills and practices, discover solutions to your leadership challenges and increase your understanding of the key trends and issues impacting nonprofits. The Global Social Business Summit provides a platform to establish connections with like-minded individuals through a range of opportunities for networking. This annual summit gathers worldwide social business pioneers from all kind of backgrounds — corporate, political, academic, civil societal — to share their expertise and to exchange groundbreaking ideas. National Arts Marketing Project Conference Nov. 8-11 Portland, Ore.
At the National Arts Marketing Project (NAMP) Conference , you’ll learn the marketing strategies that your organization needs to revolutionize the way communities engage with your organization, and explore the interactive tools and forward-thinking strategies needed to create a sense of community around your work. Big Ideas Fest Dec. 4-7 Half Moon Bay, Calif.
Big Ideas Fest is a unique three-day immersion into collaboration and design with a focus on modeling cutting-edge thinking in K-20 education.Rapid-fire speakers provide the inspiration to think differently, and Action Collabs lead the charge to create and act differently. No date set yet for the 2013 event. We can’t possibly list every conference in the world, but if you know of other nonprofit or social good gatherings that should be included here (or if you see anything amiss), please share in the comments below. • Transparency Camp: An unconference that convenes a tribe of open government advocates in Washington, DC. • SXSW Eco provided solutions for a sustainable world in October 2012 in Austin, Texas. Here’s our calendar of 2012 nonprofit and social change conferences.JD Lasica, founder and former editor of Socialbrite, is co-founder of Cruiseable. Contact JD or follow him on Twitter or Google Plus. The Nonprofit Communication Conference held on the 3rd Thursday in October (17th this year) at Drury University in Springfield, MO. Last year’s event was amazing, with 12 sessions on various communication issues. Join 250 other nonprofit professionals in this excellent one-day training. We’re hosting the next @barcampnfp in London on 21st Feb too! Sankalp Forum’s annual ‘Sankalp + Unconvention Summit’, is one of Asia’s largest collaborative platforms to bring together social enterprises, impact investors, policy makers, academicians, and other market makers. Initiated by Intellecap in 2009, with the vision of catalyzing impact investments into social enterprises globally, the forum has evolved into a community of over 400 social enterprises, over 400 investors and sector stakeholders. This year, the summit should see well over 1000 people in attendance over two days. Hi! 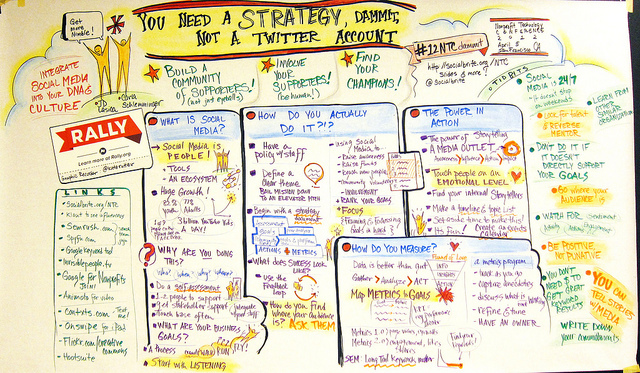 I would like to get the graphic recording created during Socialbrite’s “You Need a Strategy” session at the 2012 Nonprofit Technology Conference. Can you please share the hi-res version? @jdlasica Yes, it works! Thank you! The Duke Conference on Sustainable Business and Social Impact (SBSI) is a day-long event at the Fuqua School of Business that aims to educate and inspire students and Triangle-area professionals on rapidly evolving opportunities to create positive and sustainable change. The conference will bring together speakers from the public, private and social sectors to discuss ways they have used innovative business models, partnerships, and ideas to break the mold and change the world. Attendees will have the opportunity to explore topics through a mix of keynote addresses, thought-provoking panels and networking sessions. Panel sessions will explore a variety of topics and industries but will be organized into four tracks: Finance, Social, Sustainability, and Technology. The full conference schedule can be found at our website (http://www.dukembanetimpact.org/). Look forward to seeing you on February 20th! Questions? Please contact the conference co-chairs: Kirsten Hagfors ([email protected]) or Daniel Norber ([email protected]). If you are a young professional and cannot afford the full cost of the event, there is limited financial assistance available. Please send an email to Daniel Norber (above) for more information. DANSIC hosts Denmark’s biggest conferences on “social innovation”. This year’s conference DANSIC13 focus on social impact and takes place in Copenhagen March 7, 2013. The “The Mont-Blanc Meetings” association organize the sixth edition of the Mont-Blanc Meetings – International Forum of Social and Solidarity Economy Entrepreneurs. This forum will be held from 9-11 November 2013 in Chamonix, France, on the following theme : “Millennium Development Goals, post 2015 : Changing the course of globalization with the social and solidarity economy”. The “The Mont-Blanc Meetings” association organizes the sixth edition of the Mont-Blanc Meetings – International Forum of Social and Solidarity Economy Entrepreneurs. It is designed to support the flow of capital to early-stage companies creating change in the world. IIA’13 is an alliance of some of the most innovative impact accelerator programs in the world, convened by Agora Partnerships, with the generous support of Georgetown University. IIA’13, now in its second year, was launched to help bring opportunity to entrepreneurs and connect them with impact investors. The conference is a showcase of vetted, prepared companies ready for investment. -Drive capital into 50 of the top early-stage, for profit companies creating social impact around the world. – Create a learning space for investors, policy makers, development professionals, media and others to help advance the early-stage impact investing and impact ecosystem building. Come meet outstanding, investment-ready companies using the market the solve social problems, learn about new investment vehicles to make it easier than ever to invest, and build relationships with some of the most inspiring and dynamic change makers you will ever meet. @RicardoTeranTeran ricardoteran Thanks, Ricardo, we’ll add it! Also the Opportunity Collaboration ~ opportunitycollaboration.net ~ from October 13th – October 18th. A four-day problem-solving, strategic retreat for nonprofit leaders, for-profit social entrepreneurs, grant-makers and social investors engaged in economic justice enterprises. On World Poverty Day, break down the silos of unproductive competition and go beyond the boundaries of conventional poverty alleviation. The gathering leverages resources, shares innovations, enlists allies, builds coalitions and creates force multipliers. @topherwilkins That sounds amazing! I love the attitude of the conference site. Starting project now to get this to count for some percentage of the tropical vacation I owe my wife. The theme of this year’s conference is A Just Economy: Building Community Prosperity from the Ground Up and it is scheduled for March 20-23, 2013 in Washington, D.C.
NCRC’s Annual Conference is the largest national gathering of community non-profits, policymakers, government officials, small businesses, labor, environment, media, and academia–all focused on how together we can create a more just economic framework to improve the lives of American families, our workers, our older adults, our children and our environment, while strengthening global access to credit and capital. Early bird rates are only available until January 11th. The student rate is $25 until January 11! Just released! Download the draft of scheduled workshops to plan your conference experience. The Bayer Center for Nonprofit Management at Robert Morris University has been putting on an annual technology conference for nonprofits each year since 2003. TechNow 2013 will be held on Thursday, Oct. 24, 2013, in Pittsburgh, PA. The conference website is not ready yet, but you can follow the conference on Facebook or Twitter: http://www.facebook.com/technowconference or @TechNowConf to get updates in the meantime. @cindy_leonard @TechNowConf Thanks, Cindy, let us know when the conference site is up! The Milken Institute Global Conference will be held April 28 – May 1st in Los Angeles. The Global Conference is a serious intellectual focus with unparalleled opportunities for building new business relationships. The energy is contagious as a remarkable cross-section of leaders from the public and private sectors converges. During this high powered retreat, professionals and experts from many fields of interest are accessible and eager for discussion. ideas are exchanged in the hotel hallways, in private meetings and in the Global Conference pavilion, a central space for relaxing and networking. The conference experience is expressly designed to produce partnerships and more effective policy. Philanthropy Journal, a program of the Institute for Nonprofits at NC State University, will present a daylong, interactive “Endowment 101” workshop on Feb. 6 in Raleigh designed for staff, board members and professional advisors who want to help organizations and foundations build and sustain a successful endowment. Janet Doolin will lead participants through the strategic planning steps necessary for start-up and long term success. For details, visit http://www.philanthropyjournal.org/resources/fundraisinggiving/registration-open-workshop-provides-tools-building-strong-endowment. @Philanthropy Journal Endowment 101 sounds great, good luck with it next month! I represent GlobeMed, a student-driven global health non-profit based in Evanston, IL. GlobeMed has been a social justice organization since its inception. GlobeMed aims to strengthen the movement for global health equity by empowering students and communities to work together to improve the health of people living in poverty around the world. Our network comprises over 1,500 undergraduates at 50 universities across the U.S. and 52 grassroots health organizations in 21 countries. We believe that health is a human right, and that to improve the quality of life in impoverished communities, our best chance is to address the underlying social determinants of health. The GlobeMed Global Health Summit, which takes place annually, brings together nearly 300 undergraduates from across the country for three days of intensive lectures and discussions with leaders in global health, social policy, and political advocacy. This year’s theme, “The Student Momentum,” will create a conversation about the challenges and opportunities ahead for young health advocates in the wake of globalization. The Summit is scheduled for April 11-13, 2013 on the campus of Northwestern University in Evanston, IL. Women’s Funding Network will be hosting “Investing in Women: New Models of Giving, Impact and Collaboration” in Detroit, MI April 10 – 12. Join us for a global conference that brings together hundreds of leaders in women’s philanthropy, including grantmakers, donors, industry experts, and activists. It’s no secret that investing in women is critical to the security and growth of families, communities and entire nations. In 2013 we will explore the latest models in collaboration, in giving, and in making an impact. Hear from organizations who are making lasting systems change in the U.S. and around the world. Learn how to measure the impact of your work and tell the story to increase engagement. Be part of the discussion about the issues that call for our collective action in 2013 and beyond. Detroit is a vibrant example of a resurgent city – a resurgence that is the result of collaborations between public, private, and philanthropic organizations. 13-14, 2013 at the Pepperdine Malibu Campus (24255 Pacific Coast Highway, Malibu, CA 90263). The event will feature prominent speakers and incredible tools for professionals involved in social enterprise, nonprofits, corporate social responsibility, and faith-based organizations. Thanks for sharing about Grantmakers for Effective Organization’s Collaborative Co-Funding Event in February! GEO will also host The Learning Conference 2013 on June 3 – 4 in Miami, FL At this conference GEO will convene more than 200 leaders in philanthropy who are measuring social impact, in order to improve their work and strengthen their grantees, to learn from each other about what’s working. The Learning Conference will help to advance dialogue in the field on the role of learning in supporting nonprofit effectiveness. The program will feature ample peer learning and networking opportunities plus sessions that explore current approaches and innovative thinking, highlight practical examples, and include a diversity of perspectives and voices from within and outside of philanthropy. International Fundraising Congress: Netherlands, 15-18 October 2013. A gathering of people involved in fundraising from across Europe and the world. A friendly conference that is the right size to allow good networking amongst senior professionals. An academic program of North Park University, the Axelson Center is to enhance performance and effectiveness of individuals and organizations in the nonprofit sector through education, services, and resources. Engaged, highly motivated stakeholders—your donors, boards, staff, members, and volunteers—are critical to any organization’s sustainability. But what are the drivers that move these individuals from complacent observers to passionate advocates, and keep them invested for years to come? And how are technology, new media, and other trends changing the rules of engagement? Join us at the 14th Annual Symposium for Nonprofit Professionals and Volunteers as we share new strategies for attracting and inspiring an organization’s most critical asset: people. Overview: The nation’s top nonprofit thought leaders dialogue and share ideas aimed at increasing efficiencies and effectiveness of nonprofit organizations. To register: Call (773) 244-5799 or visit www.northpark.edu/symposium. Event: Massachusetts Conference on Service and Volunteering: YOU Generate! What: This conference brings together hundreds of professionals from across Massachusetts engaged in service and volunteer management. In addition to 30 cutting-edge workshops and networking opportunities, the day will feature an inspirational keynote address by Wendy Spencer, the CEO of the Corporation for National and Community Service (CNCS). Recognized nationwide for her leadership in the volunteer sector, Ms. Spencer has a proven track record of nearly 30 years in volunteer management and administration. For more information: Contact Lindsay Snyder, Director of External Relations & Development at 617-542-2544, x211 or [email protected] or visit: http://www.mass-service.org for conference details. Registration will begin in late March. Hi JD! YTH Live, our 6th annual conference on Youth + Tech + Health is April 7-9. Formerly known as SexTech we attract a group of technologists, nonprofit leaders, public health professionals, and youth leaders every year and we hope to make a bigger splash this year! The Annual National Animal Rights Conference June 27-30 in Alexandria, VA: http://www.arconference.org. The United States’ oldest and largest Animal Rights Conference attracts more than 1,000 leaders, activists and exhibitors. The National Scholarship Providers Association is hosting their annual conference in Portland, OR October 14-17th. Our conference hotel is the Portland Marriott Downtown Waterfront. The NSPA Annual Conference is the convergence of our profession; the intersection between diverse scholarship funders, including institutions of higher education. Come and join 350+ scholarship professionals for learning, networking, and sharing scholarship best practices. Please post if you can. Much appreciated! Saturday, Nov 2 8:00 a.m. to 5:30 p.m.
registration deadline is Oct. 23. Does anyone know of any nonprofit conferences (preferably that focus on Latin America) in December and January?